Books & Co – New York to Munich. Ed Ruscha Books & Co. Gagosian Gallery was a fantastic success. I'm very happy to be part of it. The opening on Tuesday, March 5th was widely attended. It was great to meet so many different artists who were influenced by Ruscha. I have to thank Gagosian gallery for putting on the show and for the reception after the opening. Thanks to Jeff Brouws, Wendy Burton, and Hermann Zschiegner for making Various Small Books and Books & Co. possible. Much respect to the artist Ed Ruscha. His publication, Twentysix Gasoline Stations, provided a language of minimalist sequence and seriality which has influenced the work of many contemporary artists, as well as my book, ten convenient stores. BOOKS & CO. ran from March 5 - April 27, 2013 at Gagosian Gallery Madison Avenue and traveled to Munich, Germany at the Museum Brandhorst running from June 6-September 22, 2013.
ten convenient stores in Ed Ruscha: Books & Co. at Gagosian Madison Avenue. BIG NEWS: my artist book,ten convenient stores will be featured in Ed Ruscha: Books & Co. at Gagosian Gallery, 980 Madison Avenue, New York. March 5 – April 27 2013. In the 1960s and 1970s, the artist Ed Ruscha created a series of small photo-conceptual artist’s books, among them Twentysix Gas Stations, Various Small Fires, Every Building on the Sunset Strip,Thirtyfour Parking Lots, Real Estate Opportunities, and A Few Palm Trees. Featuring mundane subjects photographed prosaically, with idiosyncratically deadpan titles, these “small books” were sought after, collected, and loved by Ruscha’s fans and fellow artists. Over the past thirty years, close to 100 other small books that appropriated or paid homage to Ruscha’s have appeared throughout the world. This book collects ninety-one of these projects, showcasing the cover and sample layouts from each along with a description of the work. It also includes selections from Ruscha’s books and an appendix listing all known Ruscha book tributes. Click here for sample page spreads. 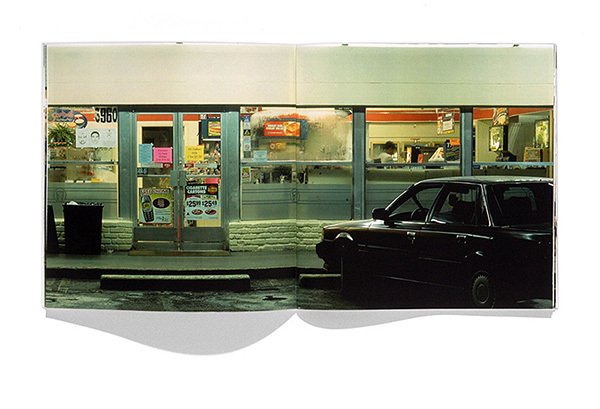 Copies of my book, ten convenient stores are available through my website here. I bound them in a limited edition of 100. See more images of the book below or click here.